The Station for today is in the celebrated basilica, St. Mary‘s across the Tiber. It was consecrated in the third century, under the pontificate of St. Callixtus, and was the first church built in Rome in honor of our blessed Lady. This is the queen of the churches in Trastevere. 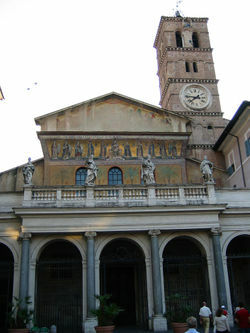 The inscription on the episcopal chair states that it is the first church dedicated to the Mother of God, although some claim that privilege belongs to the Basilica di Santa Maria Maggiore. In its foundation it is certainly one of the oldest churches in the city. A Christian house-church was founded here about 220 by Pope Saint Callixtus I (217-222) on the site of the Taberna meritoria, an asylum for retired soldiers. The area was given over to Christian use by the Emperor Septimius Severus when he settled a dispute between the Christians and tavern-keepers, saying, “I prefer that it should belong to those who honor God, whatever be their form of worship.” In 340 Pope Julius I (337-352) rebuilt the titulus Callixti on a larger scale, and it became the titulus Iulii commemorating his patronage, one of the original twenty-five parishes in Rome; indeed it may be the first church in which Mass was celebrated openly. It underwent two restorations in the fifth and eighth centuries. In 1140-43 the church was re-erected on its old foundations under Pope Innocent II. The richly carved Ionic capitals reused along its nave were taken either from the ruins of the Baths of Caracalla or the nearby Temple of Isis on the Janiculum. When scholarship during the nineteenth century identified the faces in their carved decoration as Isis, Serapis and Harpocrates, a restoration under Pius IX in 1870 hammered off the offending faces. The predecessor of the present church was probably built in the early fourth century although that church was the successor to one of the tituli, those Early Christian basilicas that were ascribed to a patron and perhaps literally inscribed with his name. Though nothing remains to establish with certainty where any of the public Christian edifices of Rome before the time of Constantine the Great were situated, the basilica on this site was known as Titulus Callisti, since a legend in the Liber Pontificalis ascribed the earliest church here to a foundation by Pope Callixtus I (died 222), whose remains, translated to the new structure, are preserved under the altar. and grant them the unceasing loving kindness they implore.